⋅ More than 90% of students receive need-based financial aid or merit scholarships. ⋅ Students are automatically considered for merit scholarships ranging from $3,000 to $24,000. ⋅ Talent scholarships are available in music, theatre arts, studio art/art history, and forensics (debate). 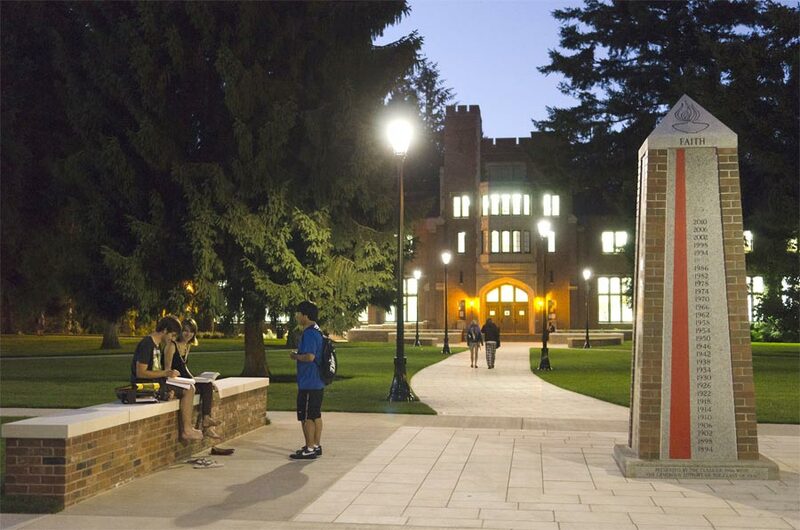 Founded in 1888, Puget Sound is one of a handful of selective liberal arts colleges in the Pacific Northwest. The college features an intellectually lively and academically motivated community. Located on an intimate and inviting campus between the Olympic and Cascade mountain ranges, along the shores of the Puget Sound near the creative urban center of Tacoma, Wash., the college offers close proximity to the cultural offerings of Seattle and the natural wonders of the Pacific Northwest. Puget Sound offers the distinctive combination of an outstanding liberal arts curriculum and Schools of Music and Business and Leadership. Innovative interdisciplinary programs include Asian studies; environmental policy and decision making; gender studies; global development studies; international political economy; Latin American studies; neuroscience; and science, technology, and society. Puget Sound is the only national independent liberal arts college in Western Washington, and one of just five independent colleges in the Northwest granted a charter by Phi Beta Kappa, the nation’s most prestigious honor society. Students study abroad in more than 100 programs in 40 countries. As a founding member of the Nationwide Internships Consortium (NIC) and a participant in the Liberal Arts Career Network (LACN), Puget Sound connects students with thousands of internship opportunities across the country. The college has close ties to Asia, including an Asian Studies Program; majors in Japanese, Chinese, and East Asian languages; and a nine-month Pacific Rim Study Abroad Program. Puget Sound’s commitment to environmental sustainability includes STARS certification and numerous LEED-certified campus buildings. In fall 2016, Puget Sound opened the Athletics & Aquatics Center, with a new 25-yard pool; a two-level, 12,500-square-foot fitness center with a climbing wall; and a juice bar as part of our commitment to supporting an integrated living and learning experience for our students and competitive training facilities for student-athletes. The School of Music at Puget Sound offers degrees in Music Performance, Music Education, and Music with Elective Studies in Business. Students benefit from the school’s excellent faculty, broad ensemble offerings, student-run clubs, and the opportunity to audition for talent scholarships regardless of their major. A student-faculty ratio of 11:1 means small classes and close, personal attention from faculty members. More than 1,200 classes are offered each year in more than 50 traditional and interdisciplinary areas of study. All classes and labs are taught by professors, never by graduate students or teaching assistants. 99% of tenure-line faculty members hold a doctorate or equivalent degree. Students are actively engaged in co-curricular activities, including more than 100 wide-ranging organizations and clubs, student media, student government, and fraternities and sororities. Nearly 70% of students, including all first- and second-years live on campus. Themed residence halls and houses, such as the Adventure Education community and the Japanese House, support the college’s 24/7 living-learning environment and create strong links between academics and residence life. Puget Sound’s robust outdoor programs take advantage of the nearby Cascade and Olympic mountains, national parks and rain forests, and the beaches of the Pacific Ocean. More than 75% of students participate in a wide range of service opportunities with approximately 250 community partners. Students compete in 23 varsity sports in the NCAA Division III Northwest Conference (NWC), as well as in a variety of intramural and club sports. Puget Sound students have earned more than 200 national scholarships since 2001, including Fulbright, Rhodes, Goldwater, Watson, National Science Foundation, Critical Language, Boren, Princeton in Asia, and Luce in Asia Scholarships. nationwide whose graduates go on to earn doctorates, according to data from the National Science Foundation Survey of Earned Doctorates. Puget Sound ranks No. 1 among baccalaureate colleges in Washington state, and in the top 10% nationally, for number of graduates who go on to earn doctoral degrees, according to a survey by the National Opinion Research Center (NORC). Puget Sound graduates enjoy outstanding acceptance rates to medical and law school. The college fosters a strong culture of service, and is consistently ranked among the top small colleges for alumni serving in the Peace Corps and Teach for America. A strong alumni network provides students with lifelong connections and learning opportunities.